Travel Booking Turkey by Imperial Travel Turkey will today introduce you to one of our most-preferred packages: 13 Days Turkey Tour Adventure which combines the most-visited highlights of Turkey with its center of leisure; including Cappadocia, Antalya, Pamukkale and Ephesus. For the beginning of your 13 Days Turkey Tour, our crew will welcome you at the airport upon your arrival in megacity Istanbul and transfer you directly to your hotel in the Old City for an overnight stay. You will be having your first excursion on your second day with a full day Istanbul Walking Tour with professional English-speaking guide who will show you around all the main attractions and ruins of the historical peninsula with no hassle. Enough with Istanbul for now, you will get picked up from your hotel early in the morning and transferred to airport for a short, domestic flight to Cappadocia. Once you set foot on what we call ”fairyland”, you will either be transferred to your authentic cave hotel or directly to the tour site to depart for a unique daily excursion in the moon-like landscape which is North Cappadocia Tour. It will be then followed by an exhilirating Hot Air Balloon Ride experience early in the morning on the next day and Southern Cappadocia Tour to discover even more attractions. On day 5, pick up at noon from your cave hotel in Cappadocia, you will be driven to Antalya via Konya & overnight in Antalya. Your second day in Antalya will be covered with a full day Perge, Aspendos & Side Tour which is full of sightseeing and adventure. On day 7, you will be having an amazing boat trip in Antalya. Aside from the beautiful waters of Mediterranean Sea and beach-side activities, you will have the chance to visit Duden Waterfall, Rat Island and Akyarlar beach in a day full of amazing sights in this tour & transfer back to hotel for overnight on the seventh day of your 13 Days Turkey Tour Adventure. Toward the noon on the following day, you will be heading to Pamukkale via 5 hours ride & overnight in Pamukkale. 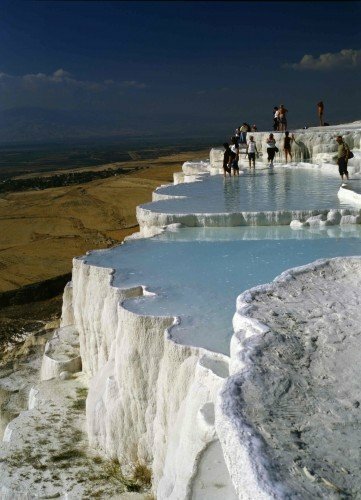 Your following two days in the region from this day on will be covered with Pamukkale, Hierepolis Ancient City & Ephesus Tours (departure from Kusadasi) by which you will definitely satisfy your inner history buff as well as witnessing numerous natural beauties. Then we come to day 11 on which you will be having a full day Priene, Miletos and Didyma Tour (also called as PMD) These three iconic ancient cities will absolutely draw your attention. Day 12 will be then yours to relax and enjoy yourself in beautiful town of Kusadasi after long days and journeys until you get picked up in the evening and transferred to airport in İzmir for a return flight to Istanbul. We will conclude our services for you with a Half Day Bosphorus Cruise on the final day before you get transferred to airport for your international departure flight. If you are looking into more packages like 13 Days Turkey Tour Adventure, please do check out our Turkey Tours category on the top menu or just feel free to drop us an e-mail to create your exclusive, tailor-made one upon your time, budget and interest.